Many of us spend a relative amount of time in our cars or vehicles, but how often do we really consider our health and spinal care whilst driving? 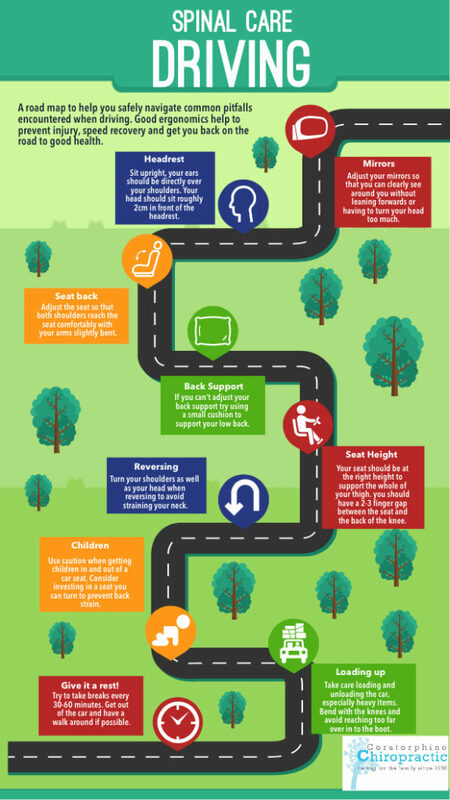 The team at Edinburgh based clinic; Corstorphine Chiropractic have pulled together a rather handy infographic to make sure you keep your ergonomics in check whilst on the road! Good spinal health and considering your spinal care whilst driving is so important – particularly if you regularly embark on long journeys or lift heavy items in and out of your vehicle. If you do find yourself with any low back pain, knee pain or shoulder pain whilst in the car (or outside of the car! ), then be sure to contact the team at Corstorphine Chiropractic who can help you get “back” on the road to recovery.